Travelling last summer with Rhoda the motorhome, was for me, the perfect way to vacation. Wherever I went, my “stuff” went with me. I stopped often, especially at any place that called to my sense of adventure and at the end of the day, I got to sleep in my own bed. Ahhh, what warm fuzzy memories that brings back. As ideal as the trip was, I regretted not having alternate transportation. There were times when I stayed in a place so rich with history or with such breathtaking panoramas, that I would have liked more time and a smaller vehicle with which to explore. Let me give you a specific example. I was set up here. 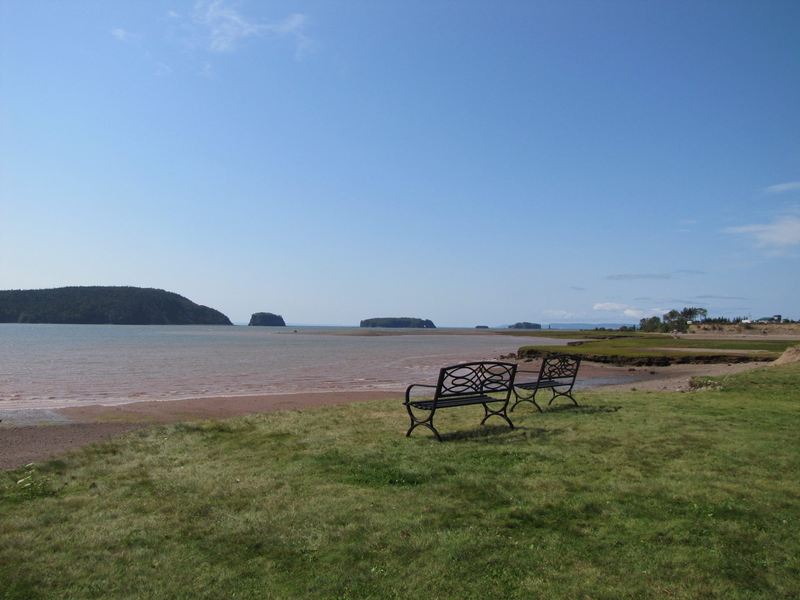 Connected to all services with this gorgeous unobstructed view of the Bay of Fundi in Nova Scotia. Mere steps away from the changing tides which were spectacular events to witness. Ahhh, if only I had a car. I would have stayed longer and driven the winding coast. I could have witnessed the dramatic changes to the landscape from so many different places. I would have returned to camp, this camp, with freshly purchased catch of the day and had cook outs on this beach. Alas, in order to see more of the coast and the area, I shortened my stay and moved along after just a few days. Decision made! I need a tow car. Wonder how hard it would be to navigate the streets down to the warf in Halifax with Rhoda? Oh, what am I thinking? lol That would be another place I could use a car. Yes! A tow car it will be! Previous Previous post: A little cool here this morning.